We find ourselves in what we now call our safe house or the HQ in Minneapolis. Initially, it was just me, Charlie and Graeme, (Mulk the Hulk). We rented a 6 bed house in Woodbury, a suburb of St Paul (a beautiful city, unquestionably made more beautiful after the name change in the early 1800′s, before which it was known by the unromantic name, Pig’s Eye). Tranquility, excitement, hope and a degree of trepidation were our default emotions. The following day, we were joined by David Keane (the tour manager, or Obergruppenfuhrer) and Alex Conty (the tour medic, physio, therapist and RV chauffeur). Alex is a frenchman, based in London and will undoubtedly develop into one of the major characters of the trip. We began gathering a staggering amount of gear for the trip, having previously felt we were doing pretty well in terms of pre planning. Daily trips to Target, West Marine and REI became part of our pattern and the house began to fill up with boxes and bags. We also received huge piles of documents for the trip – hundreds of hugely detailed Corps of Engineers maps, laminated and bound, several hundred sheets of information about the project as we are being continually asked “what are you guys doing”? Frankly, a question we ask ourselves fairly frequently too…. A huge thank you and truly heartfelt gratitude to Dan and Trish Adams, Charlie Schroeder and Brooks Poley. These people, who if you searched in Wikipedia under “friend”, their names would be first on the list as exemplars. They are simply fantastic supporters, without whom this project could not function. HQ was then completed by the arrival of Peter Gate, who had had the trailer for the skiffs made in Canada and who drove it all the way to the Twin Cities and last but not least, Paddy Broughton (see earlier blog), who inevitably brightened everyone when he arrived. And we needed brightening as we had been wrestling from the moment we arrived with one enormous problem – we had no skiffs. Graeme and I had loaded them into a shipping container in London on the 23rd of June and they had made the US in a week. 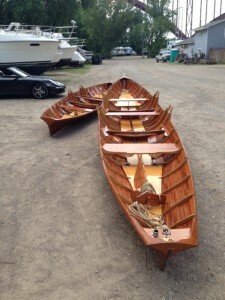 They were then due to be delivered to the St Paul Yacht Club on the 18th July, and a group of friends and supporters gathered to unload them. They didn’t arrive, but no worries, they would be here by the 19th. But they didn’t arrive. And so the days rolled by, more assurances and more no shows. It became critical when we arrived, because the week from the 26th was allocated for us to train and coach the participants that had no access to skiffs in the US. Every day there were more assurances that we realised were what might be termed “factual inexactitudes”. My frustration, em barrassment and flat-out anger grew, especially as the situation was one over which we had no control. the phone calls and emails increased in both frequency and, how shall I put this, comments to the shippers that lacked any ambiguity….. To no avail, we were simply caught in the machine. To believe the stories we were told, would mean believing that the world outside our HQ had ground to a halt, glued immovably by strikes, bureaucracy and, inevitably, “other people’s incompetence”. The container finally turned up yesterday, 29th July. Relief on a biblical scale, especially to find that the boats and equipment were undamaged. However, this leaves one day – just one day – to try to teach non-rowers how to skiff, before they embark on two successive marathon distances on the Mississippi. So a big thank you to the US transport services that combined in a witches brew of incompetents to make our lives miserable. Demain et un autre jour, as Alex would say. Was expecting some flat-bottomed, clinker-built wherryman’s conveyance suitable for tubs of butter and kegs of nails but those are beautiful, elegant craft.